The Somalia-based Islamic group al-Shabab has claimed responsibility for the Nairobi shopping mall attack that began Saturday and has left at least 62 dead, saying that the assault is in retaliation for Kenyan military operations in Somalia. The number of people killed in religion-related terrorist attacks in Kenya has dramatically increased in recent years. According to reports analyzed by the Pew Research Center as part of our ongoing global study of religious restrictions and hostilities, more than 300 people were killed, injured or displaced as a result of religion-related terrorist attacks in Kenya in 2012, more than twice as many as in 2011 and more than a five-fold increase from 2010. 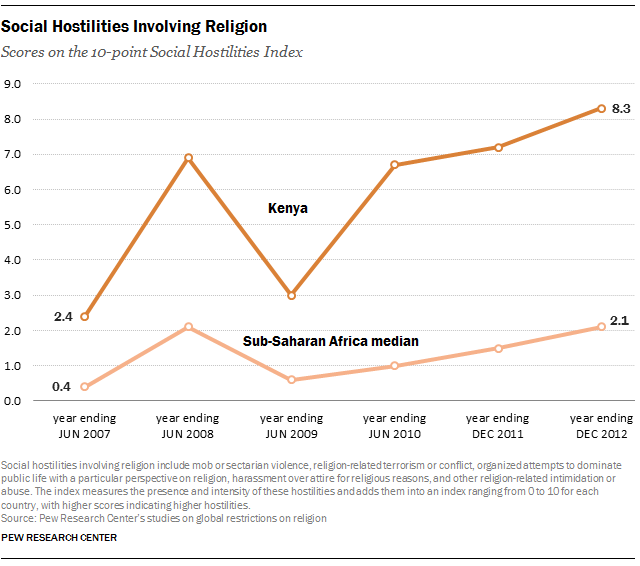 In general, social hostilities involving religion, defined by Pew Research as concrete acts of religious violence ranging from hate crimes to religion-related terrorism and war, are much higher in Kenya than in sub-Saharan Africa as a whole. In 2012, Kenya had nearly four times the level of social hostilities (8.3 on a scale of 10) as the median level among the 48 countries in the region (2.1). The Pew Research Social Hostilities Index takes into account the level and intensity of hostilities, including sectarian violence, religion-related mob violence and so-called honor killings, where the perpetrators are motivated by religion. In a March Pew Research survey, roughly half of Kenyans (55%) said Islamic extremist groups pose a major threat to their country. There have been some reports that the Nairobi mall militants are from several different countries. Kenya and Somalia are two of 51 countries where religion-related terrorist groups engaged in cross-border attacks or drew on international connections for support between 2009 and 2011, according to a related Pew Research analysis.